Slice pickles long way - so they are kind of thin. Soak in cold water overnight or at least 12 hours. Mix cup for cup water and sugar, bring to a boil. 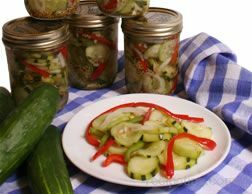 Drain pickles and put in quart jars, cover with hot brine. Let stand until cool, about one day. Refrigerate about 1 day then ready to eat.